We have a fabulous selection of luxury soft dog beds. Whether you are looking for a bright, colourful bed to cheer up your home or a simply classic bed which will look great in any room, you are sure to find your perfect dog bed here. Many of our dog beds are handmade to order for us and some can even be personalised. Our range of luxury dog beds includes the ranges from British designers Danish Design and Mutts and Hounds. Every dog needs a dog bed (or two) to curl up on and have a snooze (snoring is optional!) Here at Chelsea Dogs, we search the country for the best quality dog beds we can find and offer them to you at affordable prices. We have top designer brands of luxury soft dog beds including Scruffs, Mutts and Hounds, Danish Design and Lords and Labradors who all design their fabulous dog beds here in the UK. Lords and Labradors offer a wide range of stylish fabrics for you to choose from to make sure your new dog bed matches your home décor. 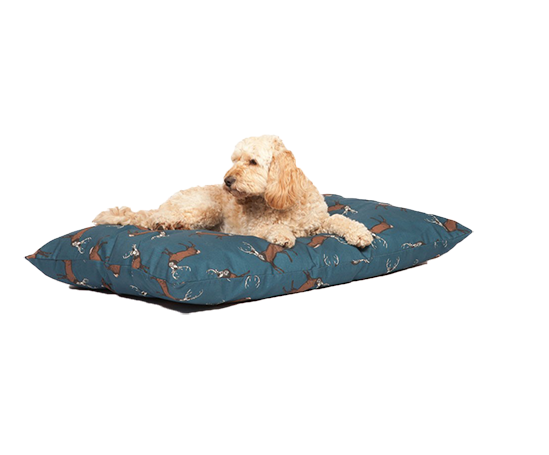 All Lords and Labradors dog beds come with a waterproof liner and removable cotton covers that are machine washable. All you have to do is choose which fabric you want and which style of bed you want. Decisions Decisions. All our luxury soft dog beds come in a wide range of sizes suitable for every breed of dog. Danish Design have a great range of tweed dog beds which are perfect for country dogs or city dogs who dream of running in open fields. Mutts and Hounds use lovely British fabrics to cover their dog pillow beds.